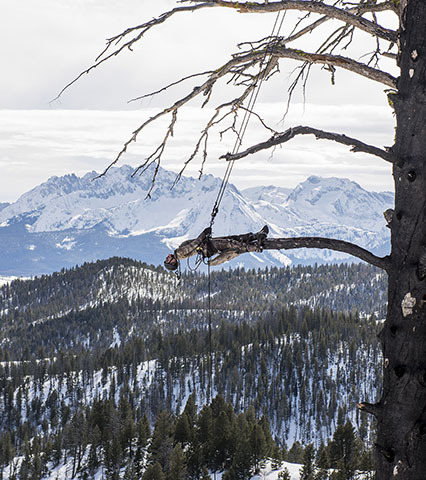 At the center of Matthew Barney’s Redoubt project (2016–19) is an eponymous two-hour film (2018; 134 mins., 3 secs.) that traces the story of a wolf hunt, intertwining the theme of the hunt with those of mythology and artistic creation. Redoubt was shot in Idaho’s rugged Sawtooth Mountains and continues Barney’s long-standing preoccupation with landscape as both a setting and subject in his films. Structured as a series of six hunts that unfold over seven days and nights, the film loosely adapts the myth of Diana, goddess of the hunt, and Actaeon, a hunter who accidentally trespasses on her and is punished. Like most of Barney’s previous films, Redoubt contains no dialogue; instead, the characters communicate through choreography that echoes and foreshadows their encounters with wildlife. Presented in conjunction with the exhibition Matthew Barney: Redoubt. Generously sponsored by the Hayden Visiting Artists Fund. Special Note: Hunting scenes in Redoubt were staged using special effects. Trained animals were provided by professional handlers who monitored their safety and the conditions on set. Wild animals were filmed in their natural habitats. The film screening is held in the Robert L. McNeil, Jr., Lecture Hall. Free; no tickets required.